Season Preparations – Get yourself ready! The new sailing season is starting soon. This is the time to prepare yourself and your Optimist. After a year of intense sailing your Optimist hull and hardware will show signs of wear and tear on several places. Before you start sailing again, it’s very important to check your Optimist carefully. Where to start? Use the Optimist season preparation tips below. The Optimist mast sleeve is fitted around the mast at deck level and protects the mast from wearing. If the sleeve is worn out, it’s time to replace the sleeve. When mounting the sleeve, you will notice the sleeve is slightly smaller than the mast. To mount the sleeve you should gently warm the sleeve with a hairdryer or paint stripper. You can easily slide the warm sleeve over the mast into position. For the correct position, have a look in the Optimist mast sleeve manual. The Optimist deck collar is made of Delrin to create minimal friction between the sleeve and the collar. The oval inner diameter allows the maximum fore/aft and minimum side play and the tapered inner diameter allows the Optimist mast to be raked. The Optimist lacing lines are being used to trim the sail. Check this lines one by one and replace if needed. Available as complete ready-to-use package and on 1.2mm and 2.2mm minireels. Besides the lacing lines, an Optimist has several lines which are being used intense and has to be checked carefully. Your Optimist sprit halyard and vang, both Vectran or Dyneema, are recommended to replace in time. Use our Vectran minireel or Dyneema minireel, together with our stainless steel splicing needle for easy splicing. 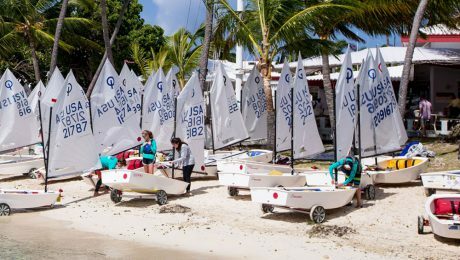 Don’t let it break during a training or regatta! Replace your tiller extension rubber joint in advance. We advise a rubber joint with fibre core. The fibre core will avoid complete failure when the rubber tears. Mounted with a pin which is kept in place by a piece of heat shrinkable tubing. 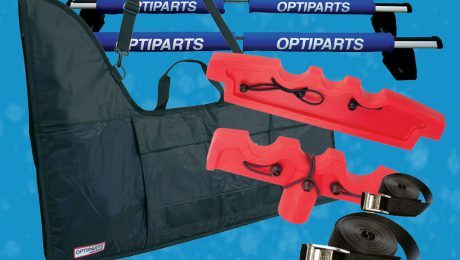 Optimist buoyancy bags are important for safety reasons and for having less water in your Optimist after a capsize. Inflate your buoyancy bags before your first training and check the next day if they are still inflated. If not, then you will have to replace your buoyancy bag(s). Please note, not to over inflate the buoyancy bags. When bags are properly filled, they will be soft to the touch. Over inflated bags may burst when heated up by the sun or rising temperatures. Make sure there are no sharp points in your boat that would snag or puncture the buoyancy bags.